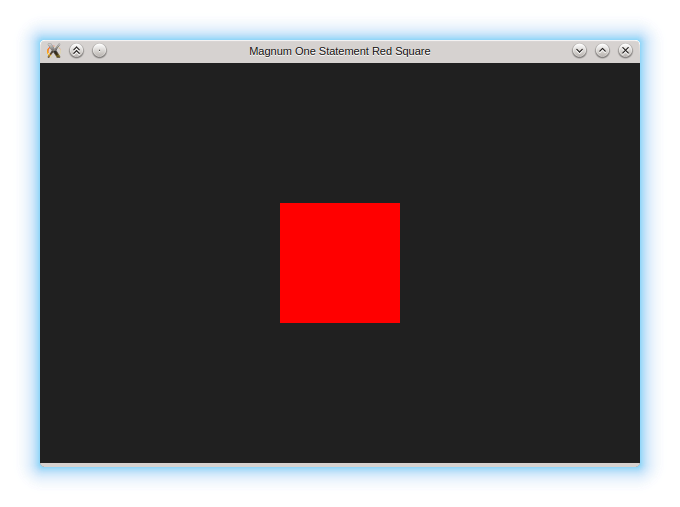 Af­ter read­ing the “How to draw a red square in Qt Quick” blog post show­cas­ing the sim­plic­i­ty of Qt API I thought it would be in­ter­est­ing to try some­thing sim­i­lar in Mag­num for com­par­i­son. This ar­ti­cle is from 2014. While great care is tak­en to keep in­for­ma­tion up-to-date, please note that not ev­ery­thing in this ar­ti­cle might re­flect cur­rent state of the Mag­num project, ex­ter­nal links might be dead and con­tent might be pre­served in its orig­i­nal form for archival pur­pos­es. Even the ty­pos. Up­dat­ed the orig­i­nal blog post URL to a ver­sion from ar­chive.org, as the blog does not ex­ist any­more. Be­sides that, code snip­pets were up­dat­ed to match APIs of Mag­num 2018.10 and some ty­pos and gram­mar er­rors were fixed. Be sure to read the orig­i­nal blog post as well so you can do a fair com­par­i­son. The code in ques­tion is above. Un­like in the Qt code we aren’t us­ing any scene graph but do ev­ery­thing di­rect­ly. In this par­tic­u­lar case the scene graph would com­pli­cate things rather than make them sim­pler. Thanks to ex­pres­sion-ori­ent­ed (and not state­ment-ori­ent­ed) API and method chain­ing it’s pos­si­ble to con­cate­nate many calls on one line. In C++ all tem­po­raries are kept un­til the end of the state­ment (the ; char­ac­ter), so the code doesn’t re­ly on any un­de­fined be­hav­ior, even though it might look like that. This is ob­vi­ous­ly on­ly per­for­mant as an one-off draw, recre­at­ing all ob­jects ev­ery frame wouldn’t be ex­act­ly ef­fi­cient. This ex­act thing can be done even sim­pler (and faster) us­ing scis­sor test and frame­buffer clear, but that’s not the point. The set­up and ac­tu­al draw­ing is now clear­ly sep­a­rat­ed. You can now see that we abused method chain­ing to cre­ate, con­fig­ure and pass the shad­er to GL::Mesh::draw() in a sin­gle ex­pres­sion, but that’s a per­fect­ly le­gal thing to do. Hav­ing 2D equiv­a­lents of ev­ery­thing al­so makes things a bit sim­pler, on the oth­er hand dis­play­ing a 3D cube would on­ly need a dif­fer­ent prim­i­tive, a dif­fer­ent shad­er with more in­volved con­fig­u­ra­tion and en­abling the depth test. The code is al­so as fast as it could get, un­less you have a very spe­cif­ic use case (like draw­ing thou­sands of squares in a par­ti­cle sys­tem). As not­ed be­fore, there is pre­cise­ly no low­er lev­el in which we could do things more ef­fici­tent­ly. The on­ly low­er lev­el are raw OpenGL calls, which would have com­pa­ra­ble per­for­mance but with far more ver­bosi­ty and less er­ror check­ing. The on­ly thing we can do is to recre­ate parts of the set­up by hand. The Mesh­Tools::com­pile() func­tion is an all-in-one tool for cre­at­ing gener­ic mesh­es from im­port­ed da­ta. In this case the prepa­ra­tion is very sim­ple, so we can re­place it with the fol­low­ing. Note that we need on­ly the ver­tex buf­fer (the in­dex buf­fer above was nullptr as it was al­so not need­ed). The li­brary is low-lev­el, but low-lev­el doesn’t nec­ces­sar­i­ly mean ver­bose. High­er-lev­el con­cepts are built on top of low­er-lev­el fea­tures, they are not re­plac­ing them. So when you want to e.g. use scene graph, you just take your low­er-lev­el code as is, wrap it in the Scene­Graph API and you are done. Many fea­tures are there to sim­pli­fy com­mon tasks (such as pre-made prim­i­tives or stock shaders), but it doesn’t mean that they will get in the way when you want to do some­thing more in­volved. Sig­nif­i­cant por­tions of the li­brary can be re­placed with cus­tom or low­er-lev­el so­lu­tions and the rest of the code will just work with them. Posted by Vladimír Vondruš on Mar 13, 2014 in Hacking. updated Nov 04, 2018 archived Tags: C++, OpenGL, Qt.